Well, San Diego, it has officially been a year since Gals That Brunch started our San Diego chapter and in the coming weeks we will be summing up our year of brunch and getting ready for the 2018 Best of Brunch. We never take for granted how thankful we are to work with all the amazing business owners and restaurants. It’s always especially a privilege when you feel like you’ve known each other for years. 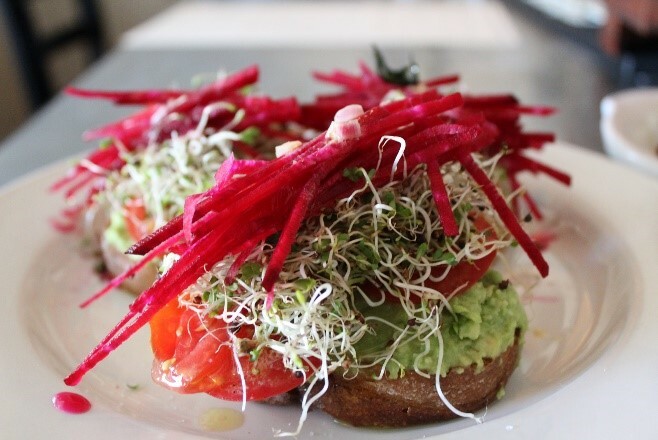 Those are truly the most magical of brunch experiences that we hold even closer to our hearts. One of those recent experiences being Pardon my French in Hillcrest with its owner Eric, which we will share more about very soon. And then, to no exception, is our most recent encounter with La Bonne Table, also in Hillcrest, with owners Sandra and Renaud Tristan. I am now having to narrow this magical brunch experience down to: Is it a French thing, or it being in Hillcrest? HA! Only time will tell! I’m sure there are sides to both arguments. As we made our way down the quaint neighborhood street of Fifth Avenue—home to brunch all-stars like Hash House. Lined with cute coffee shops and other restaurants along that pathway, you will find a darling greenish corner building. Boasting a petite patio lined with colorful succulents, there are three two-person table tops. It’s so darling you have to be careful not to miss it. As you begin to peek into the room, it will remind you of something familiar—perhaps a distant memory of an ancestral home or French countryside dinner by candlelight, that you could only imagine from the movies. La Bonne Table immediately invites you into their story with an ode to romance and a rustic, French country-style cuisine. Gals That Brunch – San Diego had the privilege to be treated to a magical and unique brunch experience, where La Bonne Table daringly allowed us—Gals That Brunch-ers—to take over their entire restaurant. It was truly the ultimate test (SAN DIEGO BRUNCH SHOWDOWN STYLE), as we filled up every seat with over 30 of San Diego’s most incredible women! This amazing husband and wife duo took us on like true champions. Between the two of them, and our awesome waiter Victor, they executed a flawless brunch experience. The type of magic brunch dreams are built upon. As we began to take our seats, we had a long table with 10 gals. If you arrived late (tsk, tsk), you were seated at the remaining tables—a majority of two-top tables or bar seating. Most of the girls giggled that this was in true “Brunch” speed dating fashion. Our eyes danced onto the menu, and the weekly struggle begins: How do you ever choose between your traditional savory or a tantalizing sweet dish? And then, sometimes, you can swindle your neighbor into “sharing,” ha! Check out the menu, and I am sure you can see why. With a seemingly small space, the owners fill it with the biggest hearts. This comes across in everything they do, from the accommodating atmosphere they so beautifully created, to each and every dish out of their kitchen—with every ingredient local and so thoughtfully designed, down to even accompaniments from their own garden. As I spoke with Sandra, our wonderful Brunch chef, she shared some further insights to the menu. She wanted it to have a focused, one-page approach that is simple, but also incredibly intricate—”the French way.” The menu will change from season to season, ensuring the flawless execution and consistency while also accommodating a node to every taste bud. The menu also has a uniquely thoughtful focus on creating vegetarian-friendly dishes, since that is something familiar and personal for her own culinary journey. In weeks leading up to our event, I spoke to Sandra almost daily. That begins to tell you the level of thought and care put into preparations for our visit. Down to even dietary restrictions, as she especially prepared a very special vegan dish just to ensure everyone had the loveliest time. I knew I would love her. From the moment we met, we shared a familial hug and I couldn’t wait to sit down with her and talk about her Italian heritage, love for food, romance and community. After Sandra and her husband poured their love into each dish for us to exclaim about and thoroughly enjoy, Sandra came out to join us. With a twinkle in her eye, she wove her story sharing how La Bonne was born, and how she and her husband met. We were all cheering, laughing and crying by the end. Prior to Sandra and Renaud meeting, Renaud, who is from France, had operated a wine bar in the same space for six years. “One day” Sandra walked in and the rest was history. Three years ago, they dreamt up La Bonne Table and then just six months ago, they introduced their newest labor of love—the brunch menu (and thank goodness they did). By the end of brunch, we were convinced that (if not already married) La Bonne table may just be the next best stop to finding a mate – HA! And/or we all needed to find a date just take us back for dinner! We couldn’t end just yet without sharing some of the highlights from our meal. The Duck Hash was incredible. Every detail of the plate, including the greenery, was perfectly flavored and cooked to perfection. The textures that were paired together surely made this dish as impactful as it was. I assure you, not a crumb was left. It was possibly one of my most favorite savory brunch dishes this year. Any of the French Toast options are just divine. They bake all their bread in-house. With each bite, you soar to even greater levels of perfection, as it absolutely melts in your mouth. “It literally melts in your mouth,” said one of the Gals. 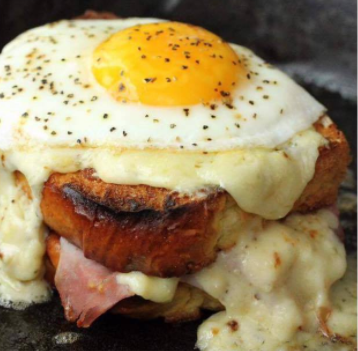 What brunch would be complete without an ode to our dear old friend, the Croque Madame. Complete with a from-scratch mornay sauce that makes you believe you were immediately transcended to France. As I described earlier, a simple approach but incredibly intricate that you could, fascinatingly enough, taste each and every ingredient. Around the table it was a beautiful sight to behold, Jubilee, our Denver city leader, was in town for the weekend and was able to join us. 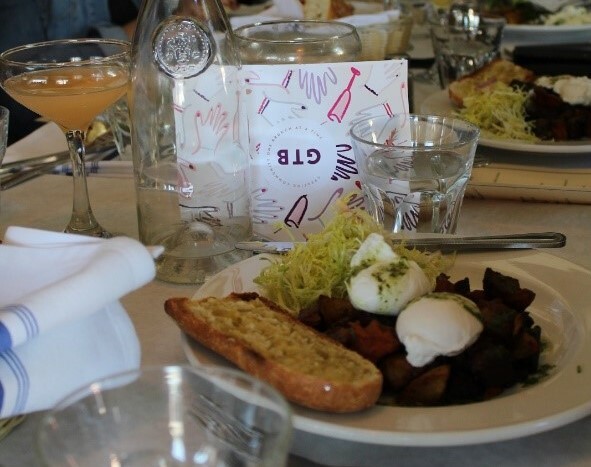 It is always such a cool experience and allows the whole Gals That Brunch movement to really hit you, and understand that we’re all part of something so much bigger than ourselves. We had some new faces that were able to join us as well and it’s always so wonderful and lovely. 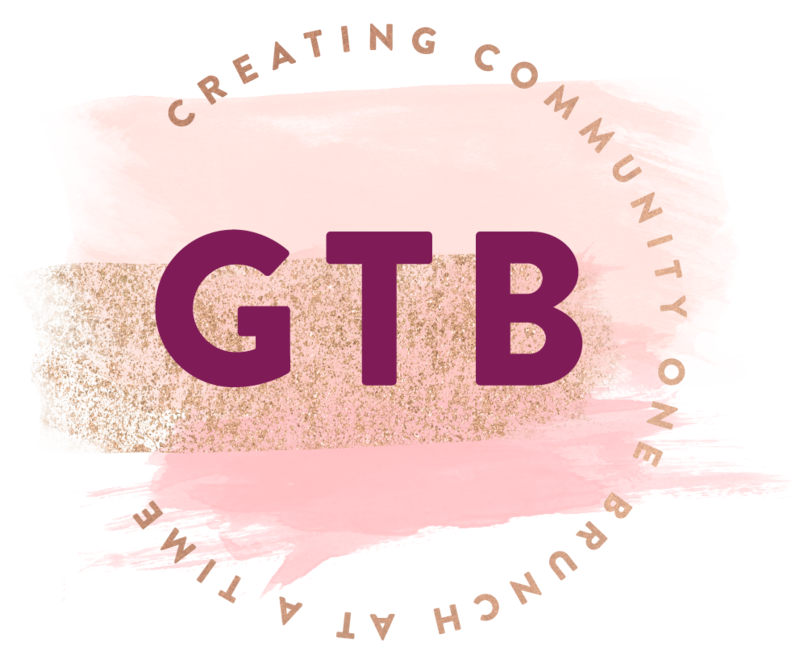 We talked about careers and how GTB got started. We talked about local adventures, cross country moves and about dreams. There was just something really special that happened all thanks to La Bonne Table. Thank you, Sandra and Renaud, for creating such a space that allowed us to really intimately engage in community. It felt as though we had all known each other for years, and swoon over your delicious and wonderful food. Sandra and Renaud, from the bottom of our hearts, thank you for creating such a wonderful experience. Thank you for sharing your story with us and extending an opportunity that allowed us to become part of it. We wish you years of incredible success and favor in all that you do. For everything you’ve both so diligently poured into your restaurant, and in sharing your passion with the rest us, we really believe that generations to come will be impacted by your generosity and heartfelt approach to your restaurant, business and food. We also wish you some well-deserved vacation time!! Cheers to you both! I bid you all a-do, for now. I am headed off to Rochester this week and going to brunch with our Gals That Brunch – Rochester chapter while I am there. I can’t wait to share that experience with you. I am sure will be incredibly special. 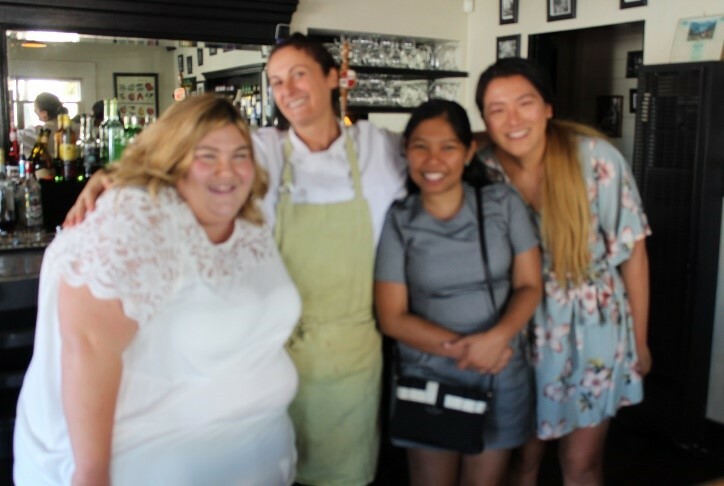 Some of the Gals with our brunch chef, Sandra!